Please, everyone, check how much car insurance you have. You might think you're "fully insured," but that doesn't mean much. Just this month, I've had multiple potential clients call me about their very serious car accidents. And when we looked at their automobile insurance policy, I had to tell them that they don't have enough insurance to cover their claims. This is the most common issue I see with people that consult with me about your car accident claims - they don't have enough coverage. Please do yourself, and your family, a favor and check your car insurance policy now! But, James, I'm "fully insured." I'm not sure where this phrase "fully insured," came from. I suspect it's an insurance marketing term to get customers to buy policies that benefit their bottom line. But in Virginia, it doesn't mean a lot. Did you know that, in Virginia, you're considered "fully insured," if you have just $25,000 in coverage? That means the person that is negligent enough to cause a crash can have as little as $25,000 to cover a claim. That's not even enough to cover one night in the hospital in many places. What kind of insurance should I buy, and how much? The good thing is that you can protect yourself from under-insured drivers who may crash into you. Check your own auto insurance and see how much under-insured motorist coverage (or UIM) you have. If you have anything less than $500,000, I urge you to get more. (In fact, I highly recommend you get $1 million in coverage.) In reality, the difference in yearly premiums between a $25,000 and a $1 million policy is only a couple of hundred dollars a year. 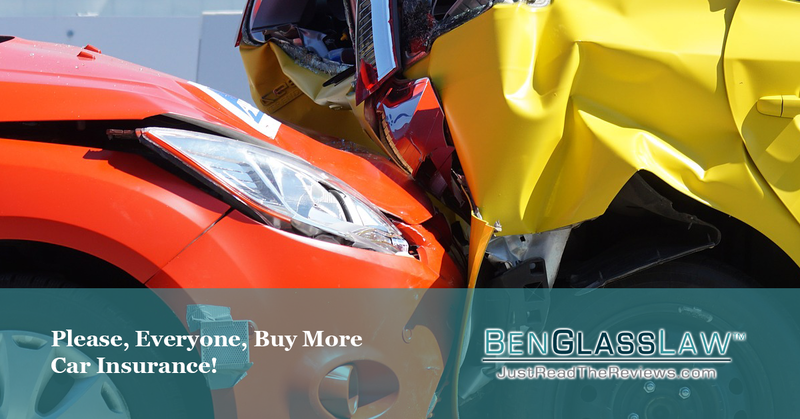 And if you or a family member is severely injured in a car accident, having enough car insurance can be the difference between bankruptcy and not. I have an umbrella policy. Shouldn't that be good enough? I hear a lot from people that they have an umbrella policy. The problem is umbrella policies typically do not include UIM coverage. They only protect you if you cause injury to someone else. But there's a really easy solution - just buy more UIM insurance. And don't let the insurer guide you to an umbrella policy. Tell them that you want more UIM.